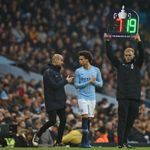 Should Leroy Sane be trusted by Man City in most crucial game? Leroy Sane was at risk of becoming Manchester City’s forgotten star, but can the winger play a huge part in their quest for the quadruple? One of the first names on the teamsheet last season, Sane has found opportunities harder to come by this campaign, and in February and March played just 425 out of a possible 1,170 minutes as City progressed in the Premier League, FA Cup and Champions League, as well as winning the Carabao Cup. The winger came on in the 89th minute of City’s Champions League quarter-final first-leg defeat by Tottenham last week, but has started the last two Premier League matches and looks refreshed as Pep Guardiola’s side prepare for one of their biggest game of the season against Spurs on Wednesday night. Sane’s attitude was criticised by Toni Kroos after being left out of Germany’s World Cup squad, but the feeling is Guardiola is looking to rouse rather than isolate. So has Guardiola sparked the German into life at the right time? And what was the issue in the first place? “He knows the reason why he hasn’t played lately,” said Guardiola last week. “We spoke often with him – myself and my people – on and off the pitch and we want the best. Guardiola does not have a shortage of options, either. Raheem Sterling is on the form of his life, Riyad Mahrez started against Spurs and Bernardo Silva has transformed from a central midfielder to a right winger. Sane has not started against top opposition since his winning goal against Liverpool on January 3, but Wednesday may be the night Guardiola puts his trust in last season’s PFA Young Player of the Year. Surprisingly, this has been Sane’s best season at City in terms of goal and assist return. Sane has been directly involved in 32 goals for City in all competitions this season, just one shy of his tally for last season, and behind only Sergio Aguero (37) and Sterling (34). But importantly, Sane is either scoring or assisting every 78 minutes compared to every 110 minutes in 2017/18 and 173 minutes in 2016/17. This would not have gone unnoticed by Guardiola. The statistical proof that City performances improve when Sane starts will not have escaped his notice either. City’s win percentage, average goals for, possession, shots per game, crosses per game and passing accuracy are all up with Sane starting compared with him not starting. Whether an on-field or off-field issue, Sane’s reduced playing time would not have been a decision taken lightly by Guardiola. Sane will hope he has worked hard enough to be given a chance to prolong City’s Champions League quest, starting on Wednesday. “I know people say I came here to win the Champions League, but I didn’t come here to win the Champions League, honestly,” Guardiola said on Tuesday. I see Raheem Sterling and his pace, it is just brilliant to watch. His goal against Crystal Palace, for example. The ball from Kevin De Bruyne combined with the run inside the man from Sterling was just sensational. I hope for their sake they start Sterling, Leroy Sane and Sergio Aguero once again, as these can damage Tottenham, who will sit in and play on the counter-attack with Lucas Moura’s pace. Sometimes you can force the pass in these games and the key to this game is De Bruyne. He has the determination to find the pass and he is good without the ball as well. Man City will go through – it will go right to the wire, but City are still holding the edge at this moment. Even at the weekend, they conceded to make it 2-1 but had the final push to get another. Tagsreadly.info Time for City to trust Sane?